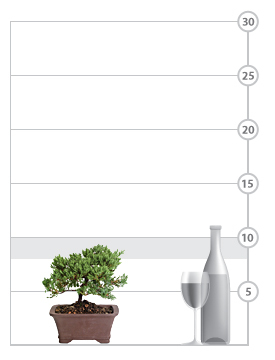 Please note: We are shipping the bonsai with a brown oval ceramic pot instead of the rectangle one pictured. 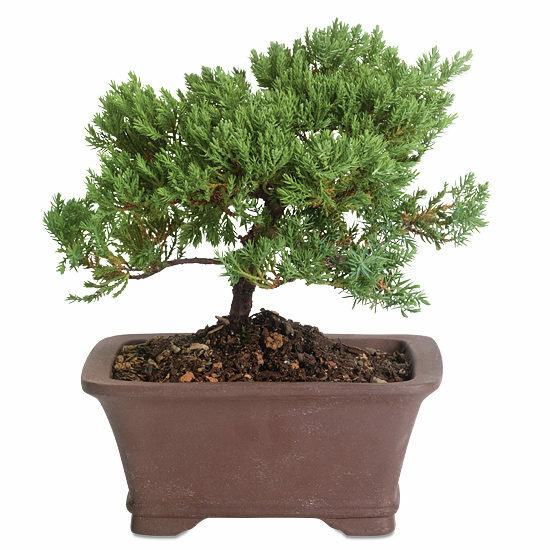 This three-year-old juniper, trained to a height of 8″ – 10″, exhibits the characteristics most prized by bonsai enthusiasts, including a wide, triangular “head” of foliage and exaggerated width to height proportion. An excellent choice as gifts for young and old, each diminutive tree represents nature in concentrated form, and no two are ever alike. Your bonsai, surrounded with mossy stones, will arrive planted in a traditional Japanese earth brown ceramic pot. Please note: Delivery to California is not available. Place in a well-lighted area that receives an hour or so of direct sun. Bonsai require consistently moist soil; your plant should be checked daily. Keep thoroughly moist by watering from the top, and allowing proper drainage. You may fertilize every 6 weeks during spring and summer, with regular houseplant food at ½ strength.